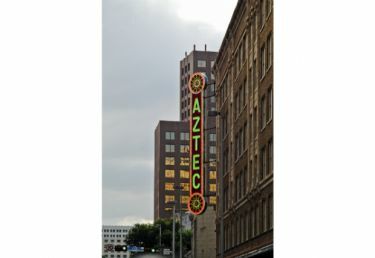 The Aztec Theatre is San Antonio's premier historical multi-purpose entertainment and events facility. Located in the heart of downtown at the corner of Commerce St. and St. Mary's St., the Aztec Theatre in one of the Alamo City's most cherished architectural and historical landmarks. Considered by many as a Meso-American architectural work of art, the Aztec boasts a dramatic combination of authentic columns, reliefs and artifacts. From its stunning lobby and mezzanine to the glorious theatre and balcony, the Aztec Theatre is an experience unlike any other.